Whether you’ve found your way here because you watched the recent Drama Channel repeat run of Tenko or you just wanted to check out what sort of information was out there on the web about this amazing drama series, we just want to make sure that you know about the 2012 book Remembering Tenko from Classic TV Press which would make the perfect Christmas present for anyone who enjoyed the series. Packed full of interviews with the series actresses – Ann Bell, Stephanie Beacham, Louise Jameson, Stephanie Cole and many more – and behind-the-scenes anecdotes about the making of this wonderful series, this acclaimed book (currently fifteen 5-star reviews on Amazon) is also illustrated throughout with hundreds of photographs, as well as drawings by Tenko’s original titles designer. The book also boasts a foreword from the series creator Lavinia Warner who fully endorses the work, while the real-life story of the women prisoners of the Japanese, which inspired her to create Tenko, is also documented in detail. The book can be purchased from Amazon as a regular book or as an ebook for Kindle. N.B. Memorabilia from the series is available here. Given the outstanding quality of this reunion special it is something of a mystery that this final feature-length slice of Tenko does not enjoy a better critical reputation. This state of affairs is even more curious when one considers just how many inferior and ill-conceived specials and spin-offs have positively littered the TV schedules over the years. It is no exaggeration to say that this beautifully scripted – and acted – finale, which is chock full of nostalgia, suspense, humour, adventure and romance, ticks all the dramatic boxes. More importantly it does justice to all of the returning characters as we revisit them five years after the end of the war. The prospect of witnessing their reunion is a truly tantalising one, as the questions of what has happened to them since the war, how they will now interrelate and whether their time in the camps will still bind them, are set to be explored in some detail. It is incredibly gratifying to almost immediately see all the characters again in new surroundings, as the settings, script, costumes and make-up come together effortlessly to give a real sense that years have passed since we last saw them. Quite rightly former leader Marion is the focus of the narrative, initially anyway, as she rather desperately sets about ensuring that the reunion takes place. We quickly learn that Marion’s chief motivation is simply loneliness, following her divorce from Clifford two years earlier. 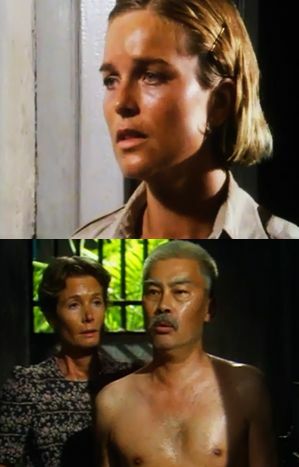 While news of their divorce is surprising, especially given how much of the screen time of the final episodes of the third series were given over to the pair’s attempts to save their marriage, the idea that in the end ‘the effort was too much’ makes sense and reminds us that one of Tenko’s great strengths is its realistic approach to relationships. It is glaringly obvious that Marion needs the reunion more than most of her former internees. She is once again at a very low ebb and her relationship with the gin bottle is flourishing. Nevertheless, on returning to Singapore, it takes some time for her to be honest about how she feels, and she is instead compelled to put up a front about how full her life is: ‘I have Ben, I have friends. Did I tell you I work for the Red Cross library service?’ That she has actually packed a bottle of gin in her suitcase tells another story entirely, while her use of the word ‘amicable’ several times to describe her divorce from Clifford is also revealing. Interestingly it takes Ulrica to state: ‘Divorce cannot be easy, even if it is amicable,’ making it clear that she does not entirely buy the front her friend is presenting. Although news that her ex-husband and his new wife are having a baby has got to her, the real trouble is her deep frustration with only ever having ‘been known as part of Clifford, except in the camp’ and, now that she is divorced, having ‘no identity at all.’ Her off-screen rejection by a supposed old friend, ostensibly because she would put the numbers out at dinner, emphasises her predicament perfectly. However, the question remains as to how Marion can continue to feel useful after the reunion, as one would hope that she would never find herself in such a life-or-death situation with the other women again, indeed a repeat scenario would stretch credulity unduly. The answer turns out to be rather simple: the return to England of many of her dear friends, where she can be near them, and specifically her close friend Beatrice coming to live with her in her large, empty house. 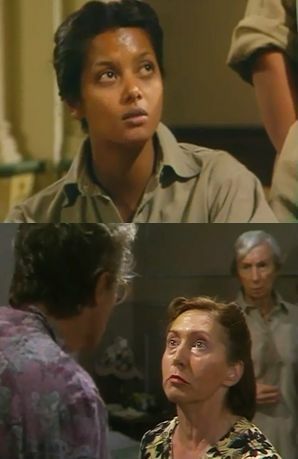 It is Ulrica who realises the importance of this arrangement to Marion and alerts the doctor to it: ‘She needs you Beatrice, more than you need her.’ As the special ends, with Marion hosting a veritable houseful of guests for Christmas, the former leader is once again in her element as a past (represented by her friends from the camp) that was in danger of slipping out of her reach entirely has instead become an integral and fulfilling part of her present. There is a sense that Marion’s quest for a purpose in her life, which started in the very first episode of series one, is now at an end. The unenviable task of penning a final instalment which would stand as a suitable conclusion to all three series and wrap up all of the loose ends (there being no certainty at the time that the series would return for a reunion special) fell to Anne Valery. By and large Valery achieves this aim, with an episode most notable for: the unexpected death of Joss, whose last wishes are to have far-reaching consequences for Beatrice and Stephen; the forging of a ‘new honesty’ between Marion and Clifford; and suitable remembrance of all of the women who did not survive internment. Despite the frequent references throughout the final series to the fact that Joss is ‘done in’, her death still comes as something of a surprise, perhaps because she has always seemed to be such an indomitable character (as Beatrice tells Phyllis, she has ‘broken more bones than I’ve had hot dinners and she’s always bounced back!’), or perhaps because it seems unlikely that they would kill off one of the regulars just before the long-anticipated sail home. Of course, as it stands, the decision to kill her off is very Tenko. It is after all a series that is defined by death and the unfairness of life, so in this way it is perfectly in keeping. Joss’s passing also pays many dramatic dividends: not merely reuniting the women in grief for one last time, but also leading to the appointment of Beatrice and Stephen as joint trustees of a new foundation, as each is given a renewed purpose in life and prepares to go into affectionate and comedic battle with the other. Jean Anderson makes the most of her solitary final speaking scene as Joss – the quintessential difficult patient – who, as always, has no intention of making life easy for anyone around her. Her wilful disruption of the ordered job Beatrice makes of her hospital bed is ‘pure Joss’, a fact that we are later reminded of as, after her death, the doctor surveys her neat Raffles bed, clearly uncomfortable with ‘how very tidy it is.’ That Joss signs off by recounting a typically riotous story of an escapade she enjoyed with Monica involving a motorbike, Blackshirts and – inevitably – some swearing, feels just right. One of Beatrice’s lines in the same scene, in which she tells Joss that Stephen is ‘lost without you to goad him,’ has more significance than she can possibly imagine, seeing as it either confirms Joss’s decision to cast Beatrice in that very role in the future, or is the actual birth of the idea. The moment in which Beatrice reveals the news of Joss’s death to the others with the words: ‘Our dear friend Joss,’ delivered by Stephanie Cole with a slight crack in her voice, makes for suitably emotional viewing. While the scene at the Centre which immediately follows, framed with Stephen in the foreground and Beatrice in the background, is an obvious contender for sequence of the episode, as the former, very truthfully, fails to come to terms with having Joss taken away from him. Stephen is full of recrimination, musing: ‘If I’d stopped her doing so much,’ while Beatrice allays his guilt by sagely pointing out that no-one could have done that. Ironically, given the yet-to-be-revealed contents of Joss’s will, his grief makes him hate the Centre (‘every stick and stone’) and want to ‘close it down for ever.’ Another piece of eloquent scripting is Beatrice’s line about the washing she’d done for her friend: ‘Folded them so neatly, edge to edge, ready for use,’ echoing Joss’s ‘too tidy’ bed. This scene ends with Stephen’s heartfelt request that they shouldn’t think ‘for a long, long time,’ a sentiment with which we can fully identify. Joss’s ‘Jap boots’ and her battered old hat, which only in the last episode Stephen had said would remind him of her when she’d gone, serve that function very redolently here, especially when the latter is thrown down onto her coffin. It is a nice touch that it is Mrs Van Meyer of all people who also remembers Joss’s makeshift card table and is affected by the sight of her polished stone, recognising its value as ‘her pride and joy’ in their previously reduced circumstances. That Joss reaches beyond the grave as the architect of the Monica Radcliffe Foundation – a set-up which she insists will rely upon Stephen and Beatrice working alongside each other – is one of the most pleasing elements of the episode. The initial sparring that takes place as a result between the pair is hilarious, as each tries to gain the upper hand in a kind of preliminary warm-up bout before the fight is due to begin proper on Beatrice’s return. Stephen’s terrifically unwise suggestion that the doctor will ‘just have to buckle under and have done’ kicks off hostilities and it isn’t long before Beatrice (who states that she has ‘never buckled under’ in her life) is asserting authority over him as a doctor, stating – in a wonderfully blunt manner – that she is ‘coming back, if only to see you don’t louse it up, assuming by then I can still bloody well see what you’re up to!’ Stephen greets the riposte with smiling eyes, reminding us – as he recently told Joss – that he thinks there are ‘Not many people you can have a decent row with without their taking umbrage.’ He is clearly delighted to find that Beatrice, like Joss, is one of these people. Before Beatrice leaves Singapore, the fact that, as she tells him, she’s got his ‘measure’, is best suggested by her clever bribe of a bottle of gin per report, per week. However, Stephen’s twinkling response: ‘Mason, I wouldn’t bank on it. Not if I were you,’ implies that the road ahead is not going to be as smooth as she imagines and that he has many more tricks up his sleeve (or indeed down his silk pyjama bottoms). There is in the hugely amusing performances of Stephanie Cole and Preston Lockwood a basic template for the popular Nineties BBC sitcom Waiting For God, so much so that one wonders if this episode – and the reunion episode that follows – might have been the direct inspiration for its writer Michael Aitkens. 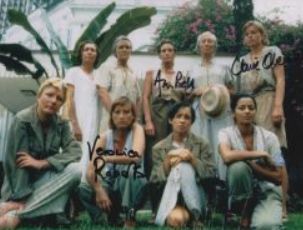 Signed photographs of some of the stars of Tenko and a very limited number of signed copies of Remembering Tenko are now available here. The beautiful limited edition Tenko prints produced by Tenko’s original title designer Ray Ogden can also still be purchased. This penultimate episode of the third series boasts a sharp script from Jill Hyem full of well-executed set pieces, which offers an equal balance of comedy and tragedy. Joss and Ulrica provide most of the humour, while the revelations surrounding Mrs Van Meyer’s marriage and Maggie’s childhood provide the tragedy, as Elizabeths Chambers and Mickery give sympathetic and well-judged performances. This is Tenko firing on all cylinders, once again prompting us to mourn its passing before it is over. 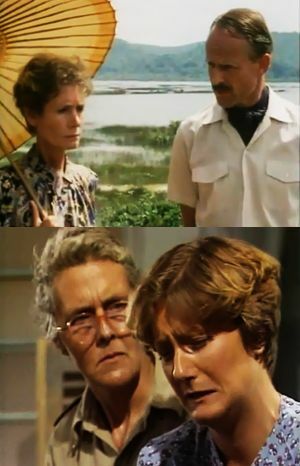 Despite the previous episode’s climax, at which Marion revealed to Clifford that she didn’t believe that they had a future together, the Brigadier starts off here by spouting the same selfish concerns that brought her to this conclusion, as he bemoans her concern for the welfare of others and her refusal to adjust to her old way of life. Phyllis, who has the misfortune of having to attend to his chauvinistic and insensitive monologue, performs the function of reacting to what he says on behalf of us viewers, as she is: scornful of his expectation that Marion will adjust within a month of being set free from long-term imprisonment; less than impressed by his priggish use of his swagger stick (tapping it on the desk before her) to emphasise his ‘unreasonable demands’; and rather dumbfounded at his belief that separating his wife from her friends from the camp in an attempt to make her forget is the best approach. Certainly all the early signs here point to a swift end to their marriage, but then Tenko suddenly does one of the things it does best: confounding our expectations, as Clifford proves determined to persuade Marion to think again. His initial approach is once again all wrong as he fails to remember Marion’s unhappiness before the invasion or to accept that everything about her has changed. However, his very un-British declaration of love and his subsequent seizing upon Marion’s view that they can only have a future ‘by starting again from scratch’ (‘Isn’t that worth talking about?’) make it admirably clear that Clifford wants to fight for Marion whatever her conditions. The comparisons that are drawn between Clifford and Yamauchi are especially interesting as Marion questions whether the Commandant did wrong by following orders (‘Isn’t that what the army requires? Duty first, instant obedience?’) and whether her husband would have done differently? And she certainly has a point when she describes the similarity between their circumstances: ‘He felt equally humiliated – stuck in a jungle with a load of women. He missed his wife and family too. He has a daughter and a baby grandson.’ Rather than going on the offensive, Clifford responds to her words with the plain statement: ‘He’ll probably hang,’ and earns an affectionate hand on his shoulder for his restraint. It is a small but important moment. This particularly well-constructed episode documents a pleasing change in Beatrice’s fortunes, a conclusion to Kate’s story, and a realisation on the part of all the former internees that their time in the camp will always be with them. 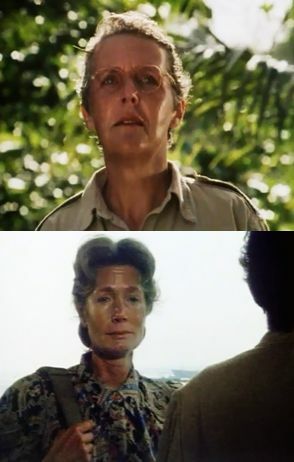 Kate is one of those second-tier characters in Tenko whose storylines have never dominated but have instead offered passing interest, such as her claustrophobic reaction to camp life in the first series and her decision to initially hide the fact that she was a nurse in the second. And yet in those rare moments where Claire Oberman has been given meatier dialogue to deliver and a more important role in proceedings, as in the opening episodes of this third series, she has never disappointed. Her performance in this episode, in which Kate is more central to the action, is no exception. Some of the episode’s most notable scenes are shared between Oberman and Peter Benson, who plays Tom’s friend Jim. In particular, Kate’s sorrowful reaction (‘Wish I’d been here’) and Jim’s anger that it falls to him to break the sad news (‘Oh Christ! … You shouldn’t have heard like this’) are beautifully played. It is a lovely touch that, in their subsequent scene together, Jim feels compelled to let Kate know that Tom used to talk about her all the time in camp (‘Where you’d live. The number of kids you’d have. Perfect wife you’d be’), and that he is endearingly honest about the fact that they used to tell him to ‘shut up about it.’ This information briefly brings Tom alive again for Kate (and to a lesser extent for us) and gives her the emotional closure she sorely needs. Initially at least, Beatrice’s role in this episode follows the same pattern as recent episodes as she mopes about in her dressing gown to no good purpose, clearly feeling defeated and worthless. However, this narrative is thankfully set to change all that, as a large chunk of it is set aside to principally prove to her that, despite her doubts and self-pity, she is needed after all. Before she turns this corner though, there is more pain to come, when: Alice declares that she is not really a doctor anymore; Phyllis insensitively refuses her offer to fetch Joss and Christina; and worst of all, Kate rejects her suggestion that she comes with them to the funeral even as she is attaching a black band to her arm (‘Oh you really don’t have to though. Thanks all the same’). Appropriately enough, it is ‘speak as you find’ Maggie, who requires Beatrice’s professional opinion, who gets through to her by giving her some home truths as to what she made of her in the camp: ‘I thought you were a right bossy cow, but I did admire your guts. You wouldn’t have thrown your hand in then nor let anyone throw theirs in either!’ The stern ‘talking to’ has an obvious effect, but it is Alice’s sudden arrival and need of her support that builds on the work that Maggie began. The realisation that Alice has not in fact been raped brings possibly the broadest smile to Beatrice’s face that we have ever seen. And from here on in it only gets better for Beatrice, as she makes herself useful by ‘mothering’ Alice (the moment in which she gathers her up in a towel and starts rubbing Alice dry is particularly charming), is apologised to (and flattered) by Stephen, who compares her to Lady Louis Mountbatten and requests her medical guidance, before Maggie finally gets a look in again as she asks her to confirm if she is pregnant. Throughout these sequences Stephanie Cole’s ‘suddenly needed’ acting is incredibly endearing as Beatrice finds herself ‘wanted in all directions’ and recognises that her life is not over after all. This reversal of fortune undoubtedly stands as one of the most feelgood storylines of the final series. This episode is very untypical of Tenko as a whole in that rather than focusing on two or three of the regular characters it chooses to follow pretty much all of them as they continue to adjust to their post-camp lives. Unfortunately the end result is a narrative that feels more disparate and less coherent than normal. Thankfully one central theme goes some way towards knitting it together: the giving of evidence, as Yamauchi’s arrival in Singapore prompts wildly different reactions from the former internees. 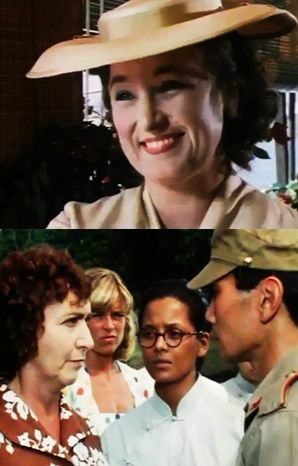 When Marion reveals that Yamauchi has arrived in Singapore, Christina chooses to defend him on the dubious basis that everyone behaves heartlessly during a war, actively seeking to make the gathered women feel guilty for what she considers to be equally heartless actions on the part of the Allies, as she details their delayed decision to arm the natives before the Fall of Singapore. Her example appears to have the desired effect on Maggie (‘I’m sorry, I didn’t know’) but it doesn’t stand up to too much scrutiny, after all it was the Japanese rather than the Allies who massacred them, whereas the Allied crime was one of indecision. That Christina seems to be blaming her former friends for this simply because of their nationality is also illuminating. The rest of Christina’s speech is similarly unconvincing as she seeks to defend her uncle’s collaboration on the ridiculous sweeping premise that most of Europe had to work for the Nazis and were therefore just the same as him. She may accuse the women of not knowing very much, but her own knowledge is sketchy, generalised and one-sided to say the least. Thankfully Beatrice makes a brief stand when Christina declares that her uncle is only behind bars because he is Chinese, but regrettably this is the full extent of the women’s response to her accusatory monologue. She ends it by stating that, like her uncle after his imprisonment, she will ‘never be the same again’ and given this tirade we can well believe it, as foundations are firmly laid for her future actions. If this scene is meant to make us question Christina’s self-righteous anger and her loyalty then it does its job, however, if we are meant to be convinced by her dubious arguments then it misfires badly and Christina should perhaps have been given more arresting and persuasive examples. Christina’s later revelation about the circumstances surrounding her cousin’s execution, which brings the episode to a rather too abrupt conclusion, offers slightly more food for thought than her earlier outburst, but it doesn’t change the fact that it was the Japanese who executed him and not the British. Furthermore, Christina’s ferocity suggests that the loyalty and/or value of the Chinese people is being questioned by those who are gathered around her, and that is just not the case. As we know, Ulrica loves the East and its people and has just volunteered to visit her uncle, while Joss and Stephen are selflessly running an amateur relief centre out of the goodness of their hearts, and Kate is spending her days nursing the sick. So, once again, Christina’s outburst feels off target. That might be intentional, but there is a strong sense that it is not. While Marion, Christina and Ulrica all elect not to give evidence against Yamauchi, who has recently arrived in Singapore – the former much to Clifford’s fury – the likes of Beatrice and Maggie are quite certain of his guilt and together with Mrs Van Meyer offer their testimony. It is fascinating that the reasons why the different characters elect to give or not give evidence are nearly all different and very personal. Marion is uncomfortable with a type of justice that will ignore any of Yamauchi’s good points, Christina clearly feels a connection with the man, while it is Ulrica’s faith which leads her to forgiveness. In the other camp, Beatrice cannot forgive the withholding of medicines that would have saved so many of the sick and dying, Maggie cannot forget the punishments and Blanche’s terrible demise, while Mrs Van Meyer simply wants to tell the truth for a change! It is testament to Burt Kwouk’s performance that despite his unflattering new garb – effectively an over-sized nappy – and status as a prisoner, Yamauchi still remains an imposing presence in the two short scenes in which he features. The first, in his cell at night, is particularly atmospheric due to the slow camera pan from the barred cell window, across the blackness, down to the composed countenance of the prisoner, Japanese-style incidental music perfectly underscoring the scene. The second, in which he is visited by Christina, serves to emphasise his calm resignation to his fate, as he accepts her gift of biscuits not for himself but for ‘the bird that comes, it will much like the little pieces.’ It is rather charming that he has named the bird after his grandson whom he has never met and is surely dead. Although this scene cannot erase the fact that the women suffered terribly under his command, it is a reminder of that which Marion is keen to hold on to: his humanity.